Several single center studies have shown that Delayed-enhancement (MRI DE-MRI) can predict functional recovery after revascularization [1, 2]. The purpose of this study was to determine the prognostic value of DE-MRI for predicting recovery of regional wall motion abnormality after revascularization in patients with chronic coronary artery disease (CAD) in a prospective, international, multi-center trial. 183 patients (167 men, age: 59.1 ± 9.7 years) with angiographically confirmed CAD and resting wall motion abnormality (WMA) scheduled for coronary bypass (n = 101) or angioplasty (n = 82) were enrolled from 9 institutions (US, Europe, and Asia) using a standardized imaging protocol. Functional and DE-MRI were performed within 30 days prior to and 5.6 ± 2.4 months after intervention. All images were acquired on a Philips 1.5 T imager with VCG gating, and a five-element synergy cardiac coil was used for signal reception. A steady-state free precession (SSFP) sequence was used for cardiac cine imaging: TR/TE/flip: 2.7 msec/1.3 msec/65°; FOV: 320 mm, matrix: 160 × 160, slice thickness: 10 mm; slice gap: 0 mm; acquired voxel size: 2.0 × 2.0 × 10.0 mm and reconstructed voxel size: 1.3 × 1.3 × 10.0 mm; temporal resolution: 25–40 msec depending on heart rate. Cine SSFP images were acquired in the two long – axis orientations (vertical long axis and 4 chambers) and short axis orientations (10 to 12 contiguous short-axis cine SSFP images from mitral valve plane through the apex). DE-MRI images were acquired 15 minutes after administering 0.2 mmol/kg of gadolinium-chelate (OptiMARK™) in the same orientation as the cine images. The DE-MRI sequence was an inversion-recovery prepared, segmented gradient echo acquisition with the following acquisition parameters: field-of-view: 384 × 384 mm; matrix size: 256 × 256; acquired voxel size: 1.5 × 1.5 × 10 mm; 32 phase encoding steps per RR interval; TR/TE/flip: 4.6/1.9/15°; NSA: 2; acquisition time per slice: 16 RR intervals. The inversion delay time (TI) between the inversion pulse and the beginning of the data acquisition necessary to null the signal from normal myocardium was determined by the Look-Locker sequence. The data acquisition was timed to occur in diastole to minimize cardiac motion. Cine and delayed – enhanced images were analyzed based on the model proposed by Kim R et al  in which the left ventricle was divided into 12 equiangular segments on 8 – 10 short – axis views, depending on the length of ventricle. Progressively worsening segmental WMA and increasing extent of DE were scored on a scale of 0 – 4 . At baseline, 5580/12274 (46%) segments had abnormal contractility, and 2974/12274 (24%) segments had DE. Improvement in contractility of impaired segments following revascularization correlated inversely with the transmural extent of scar (r2 = 0.9, Fig. 1). For instance, 72% of dysfunctional segments without evidence of scar at baseline showed improvement in contractility following revascularization, and remarkably, 52% of such segments had complete recovery of function (p < 0.001). 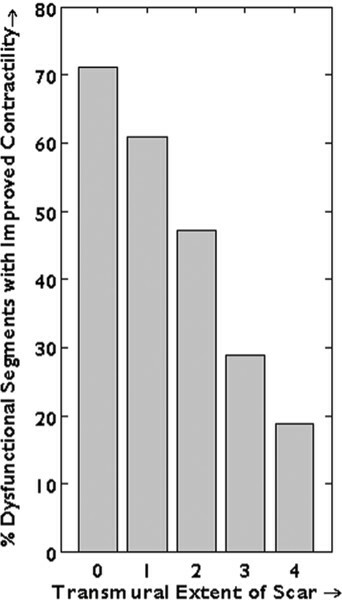 Conversely, less than a fourth (250/1438, 17%) of the segments with near or complete transmural scar (score 3 and 4) had any functional recovery (P value < 0.001). The Multicenter Viability Trial confirmed the prognostic value of DE-MRI for predicting recovery of left ventricular function recovery after revascularization in patients with chronic coronary artery disease (CAD). The results from the first, global, multi-center trial determined that DE-MRI is a robust predictor of functional recovery after revascularization.